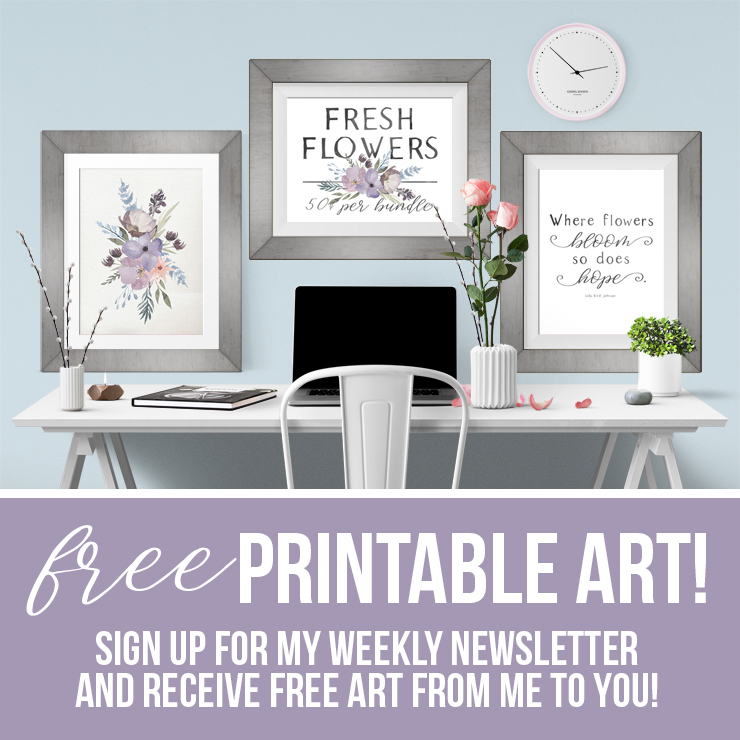 I’m a sucker for romance and romantic looking home decor and crafts. There’s just something about lacey, flowery things that I just love! Another one of my favourite things? Christmas. So why not combine romance with Christmas? 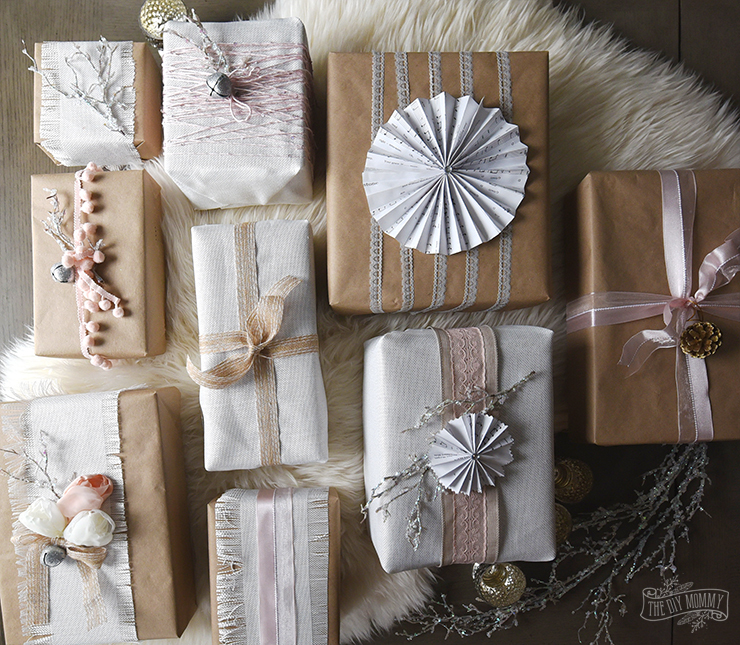 Let me show you some romantic, shabby chic inspired ways you can wrap your Christmas presents this year. 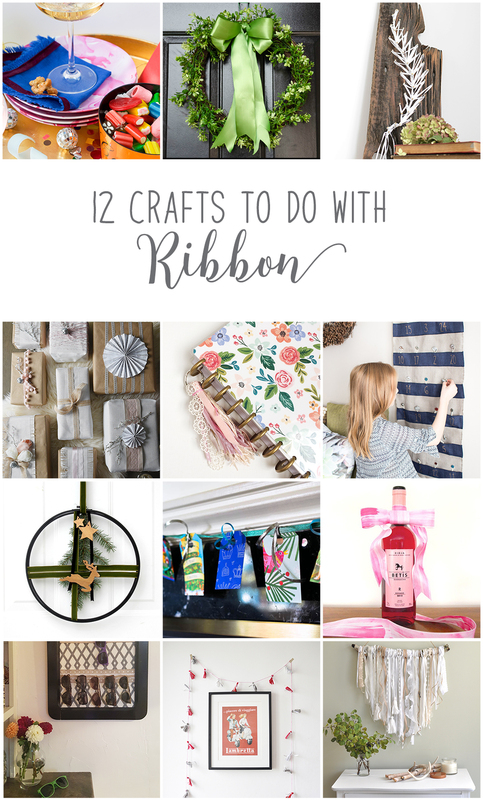 Plus, if you love DIYing with ribbon, make sure to check out more beautiful crafts you can make with ribbon from my blogging friends at the end of this post. Before you get upset with me for posting about Christmas so early, let me explain. In mid-November, I have the honour of decorating a gorgeous heritage home in Edmonton for the Homes for the Holidays event. The event is hosted by the Junior League of Edmonton, and 5 homes in the city are decorated for Christmas by teams of 5 designers and florists. 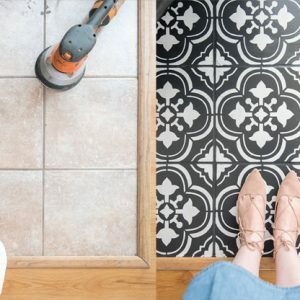 I’ll be decorating a beautiful, old brick four square and I’m incredibly excited! 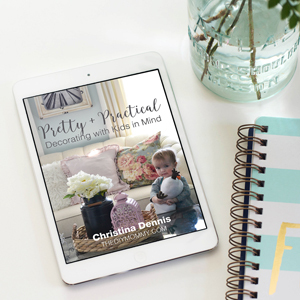 When I toured the home, I was inspired by all of its feminine details like pure white walls and crystal knobs. I decided that the perfect Christmas decor theme for the home was “Vintage Shabby Chic”. I’ll be using lots of white, pink, gold, silver and textures like lace, feathers and linen in the decor. 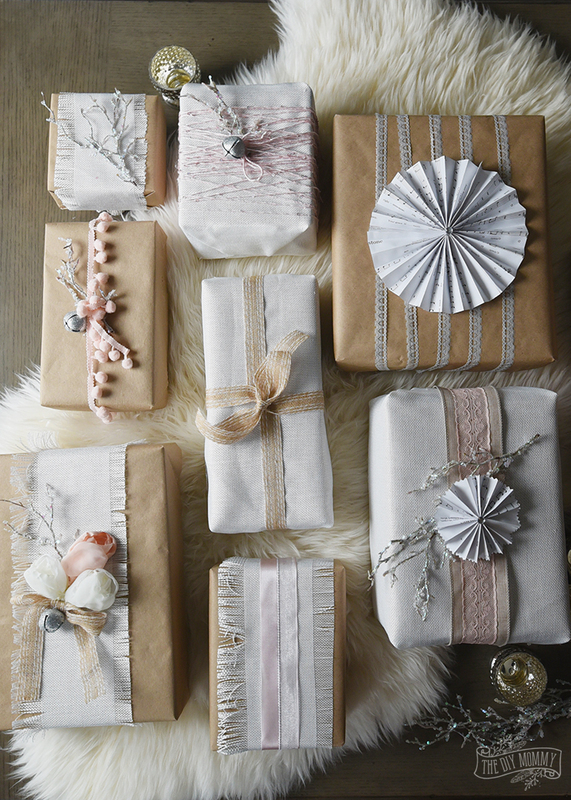 With Christmas decor comes beautifully wrapped gifts. I thought I’d better get going on wrapping some faux presents to decorate the home with. These gifts were all wrapped with items I had stashed away in my craft room. 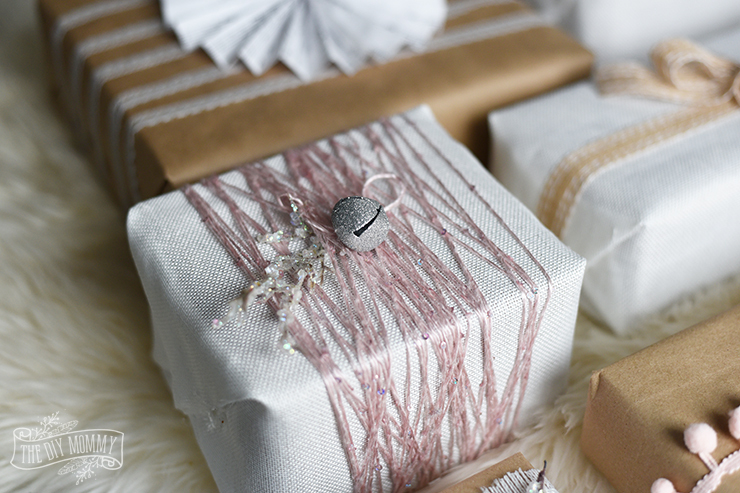 I dug up some of my most favourite textiles that I thought were shabby chic in feel: white linen fabric, kraft paper, sparkly jingle bells, sparkly faux branches, glittery yarn, fabric roses, sheets of music, lace, and – of course – ribbon. I grabbed my stash of old cereal & food boxes, some scissors, and my glue gun and got to work! 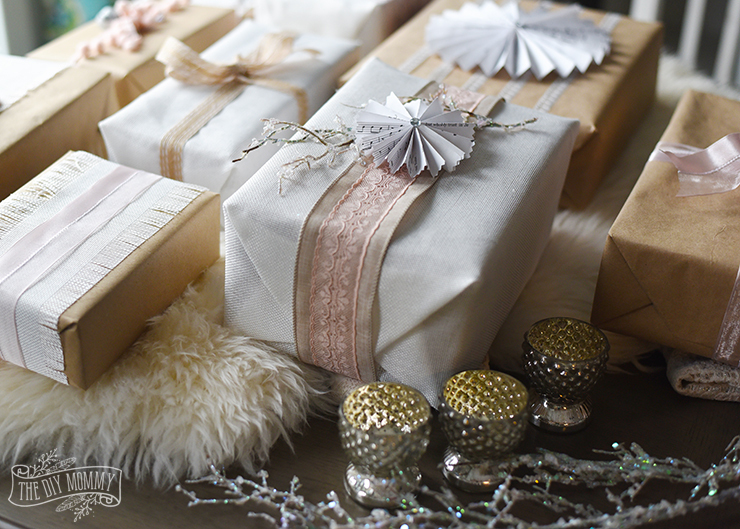 If you’re wrapping real presents, you can use tape for the paper wrapping or safety pins for the fabric wrapping. 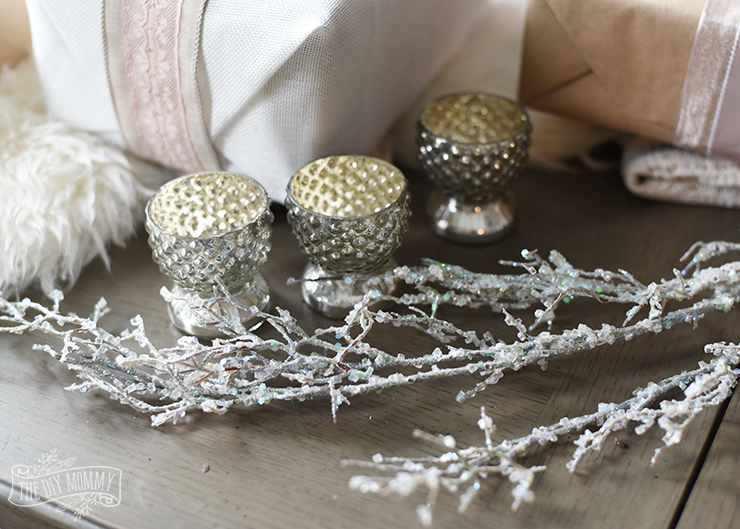 Aren’t these silver votive holders cute? They were sent to me from AFloral! I can’t wait to use them in my Shabby Chic Christmas decor. And how about a sneak peek of this gorgeous, tufted chair we’ll be using in our master bedroom makeover? I randomly stacked some of these gifts on this chair and then had to take a few photos. I thought the romantic gifts looked so pretty with this beautiful chair. This is the Caroline Wing Chair from The Brick, and when I saw it online I was smitten with its colour and style. It’s a dining chair, but I thought a pair of these would look perfect in a reading / dressing corner in our modern French Country inspired master bedroom. I can’t wait to show you in a couple of weeks what they’ll look like in the space! 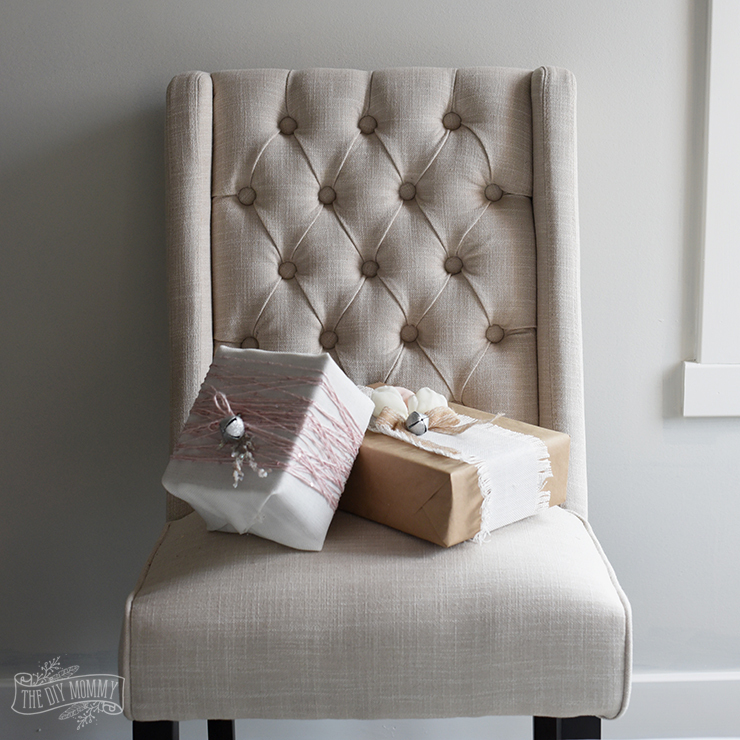 For now, I’m sure loving the chairs as a beautiful photo prop for these DIY presents. A kraft paper base with a fringed strip of poly-burlap white fabric, and a faux glittery branch glued on top. A white poly-burlap fabric base wrapped in sequined pink silk yarn and embellished with a glittery bell. A kraft paper base wrapped in thin lace trim embellished with a pleated flower made from a sheet of music. A kraft paper base with organza & satin ribbon embellished with a pine cone. 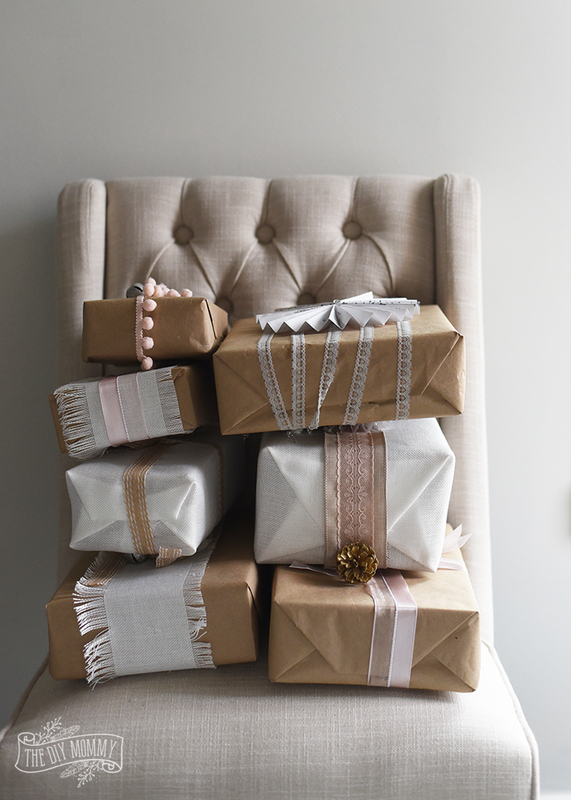 A kraft paper base tied with pink pom-pom trim and embellished with a faux glittery branch and a glittery bell. A white poly burlap base tied with a wired burlap & lace ribbon, and embellished with a pleated flower and a sparkly faux branch. 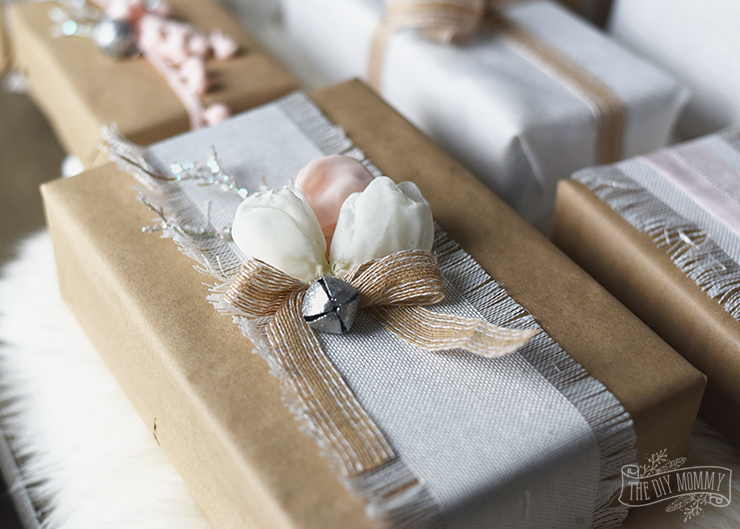 A kraft paper base with a fringed strip of poly burlap white fabric, embellished with a faux glittery branch, small DIY fabric roses, a burlap ribbon bow, and a glittery jingle bell. A kraft paper base with a fringed strip of poly burlap white fabric and wrapped with some organza & satin ribbon. These are so pretty! 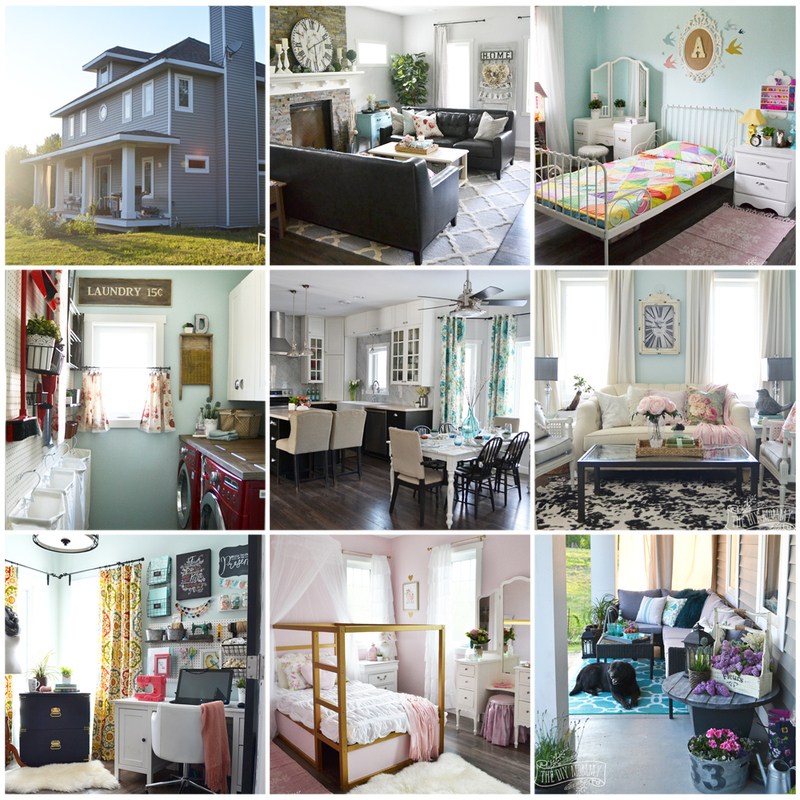 Cannot wait to see that heritage home…. I’m sure it’ll be gorgeous! Your gift wrapping is absolutely stunning Christina! I’m sure the heritage home you are decorating will be gorgeous as well. Hope to see pics! Ahhh… you captured one of my favourite things to do at Christmas time and that is to spend time wrapping presents. Thank you for the inspiring ideas! I love your colour choices and all of the creative touches you used to make each package something special. How exciting for you to be a designer decorating an historical home for Christmas. If I am up in Edmonton visiting my brother during the holiday season, I will make a point of visiting all of the homes. Thank you so much Thea! I am very excited to have the opportunity to decorate a beautiful heritage home for the holidays 🙂 You will have to let me know if you get a chance to come out this way! These are so, so pretty. 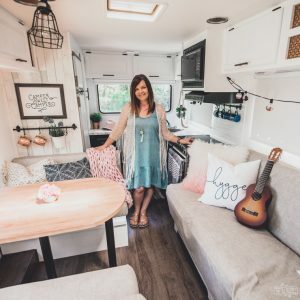 Can’t wait to see the home tour, you theme sounds perfect. I love this idea! What a fun way to use up leftover bits of ribbon, paper, fabric, and odd decor/crafting items. You nailed it! The mix of textures and light hues are sooooo pretty. Who wouldn’t feel super special getting a gift wrapped like this?? This is so Martha Stewart! I love it! The pinks and silvers look fantastic together. Well done! So romantic and totally gorgeous. Can’t wait to see the whole tour! Love these so much! What a great way to use up some crafting leftovers. Can’t wait to see the house you’re decorating!